I was the Lancôme Blanc Expert Cushion Compact roadshow few days ago at Mid Valley Megamall. Let’s get ready to Be A Cushionista!!! Hey I get to customize my very own cushion compact case using the limited edition Lancôme Parisian inspired stickers plus some of the embellishments provided. Tada… here is mine. I like it simple, classy and clean. So what is the different between Lancôme cushion compact compare to the Korean brand cushion foundation? Well, it’s not foundation nor is it a compact. It’s a cushion that gives you a dewy rosy complexion. The texture is medium viscosity fluid however it lightweight on the skin. When I applied on my face I can feel the mild cooling sensation. Use the soft insulating pad applicator to press on the cushion then gently dab on the face. For those areas that need more attention such as scars, pigmentation, uneven skin tone or skin you might need to apply one more time. Effects - complexion is left flawless, the yellowish tone is neutralize and became more even. Skin is fresh, supple and hydrated. The coverage is moderate and last about 4 hours. Skin looks more even tone, scars are less visible due to the blurring effect and of course it’s glowing. Overall, this Lancôme Blanc Expert Cushion Compact gives a more natural and sheer complexion, it’s imperceptible yet very real. 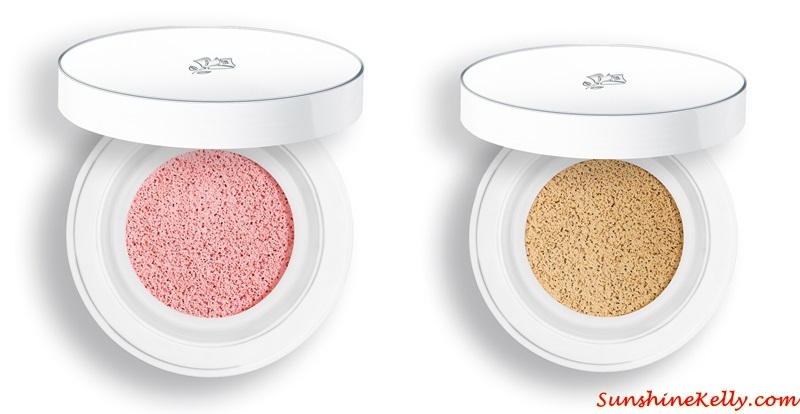 The usual Korea cushion gives enhances fair skin but not rosy. With this you will not end up looking too cakey or greyish. Even though I am using the shade O-01 it blends well into my skin tone. And thanks to the SPF 23/PA++ for extra sun protection from UVA and UVB. This can help prevent the formation of age spots and the signs of sun-related photo-ageing. Oh yes, I also tried the new Lancôme Shine Lover lipstick, it's luscious, moisturizing with moderate color payoff. I have the feminine shade of #354 which I can use it daily. Lancôme Blanc Expert Cushion Compact comes in 8 shades caters for all skin tones and is now available at all Lancôme counters nationwide. Price: Lancôme Blanc Expert Cushion Compact is retail at RM143.10 for the refill and RM37.10 for the case inclusive of GST. Head over to North Court, Mid Valley from 6th to 12th July 2015 to discover a dewy rosy experience and enjoy exclusive promotions.